1 : Section hair into three vertical sections and pull back section into a ponytail. 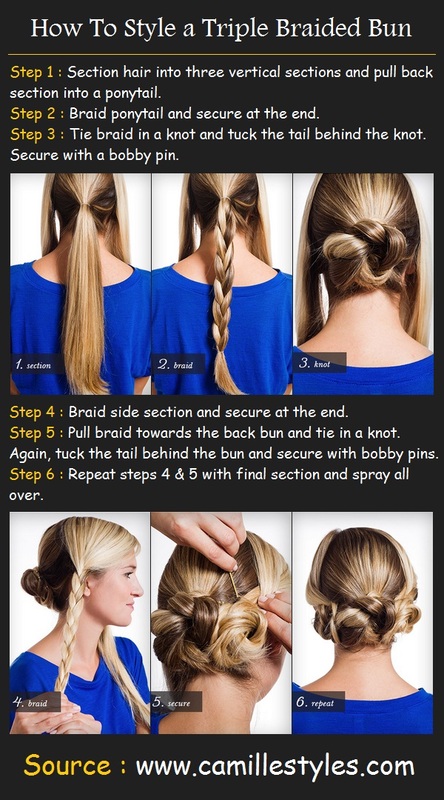 2 : Braid ponytail and secure at the end. 3 : Tie braid in a knot and tuck the tail behind the knot. Secure with a bobby pin. 4 : Braid side section and secure at the end. 5 : Pull braid towards the back bun and tie in a knot. Again, tuck the tail behind the bun and secure with bobby pins. 6 : Repeat steps 4 & 5 with final section and spray all over.